Throughout the world, milk and milk products are indispensable components of the food chain. Not only do individual consumers use liquid milk for beverages and cooking, but food manufacturers use vast quantities of milk powder, concentrated milks, butter, and cream as raw materials for further processing. Effective quality assurance in the dairy industry is needed now more than ever. 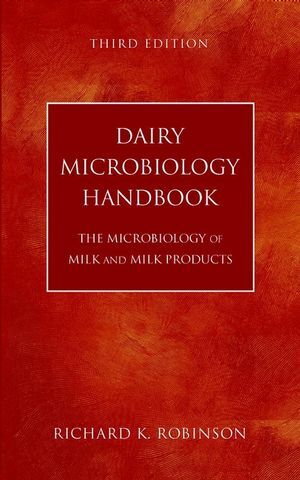 This completely revised and expanded Third Edition of Dairy Microbiology Handbook, comprising both Volume I: Microbiology of Milk and Volume II: Microbiology of Milk Products, updates the discipline’s authoritative text with the latest safety research, guidelines, and information. Quality control and product development managers, microbiologists, dairy scientists, engineers, and graduate students will find the Third Edition of Dairy Microbiology Handbook to be a vital resource. RICHARD K. ROBINSON, PhD, is Professor in the Department of Food Science and Technology at the University of Reading, United Kingdom. Microbiology of Cream and Butter. Microbiology of Condensed and Dried Milk Powders. Microbiology of Frozen Milk Products. Maintaining a Clean Working Environment. Quality Control in the Dairy Industry.